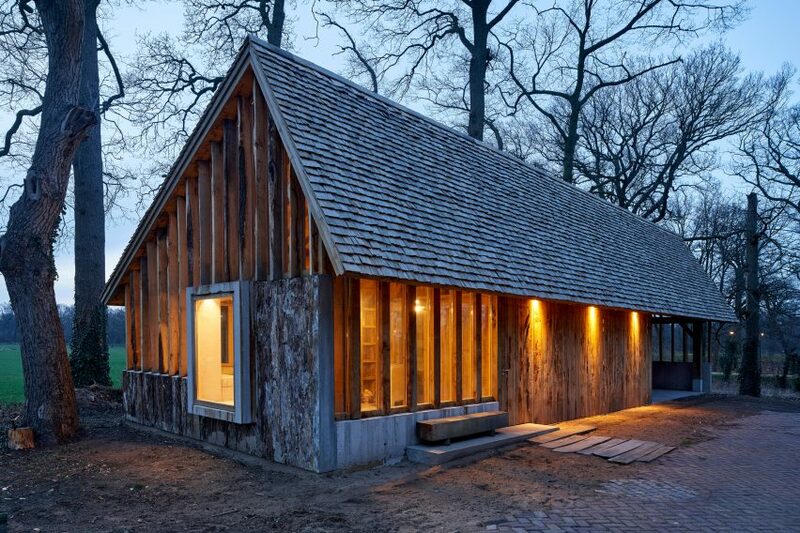 Several century-old oak trees provided wood for the structure, cladding and shingle roof of this workshop, which HilberinkBosch Architects designed to sit alongside its studio. 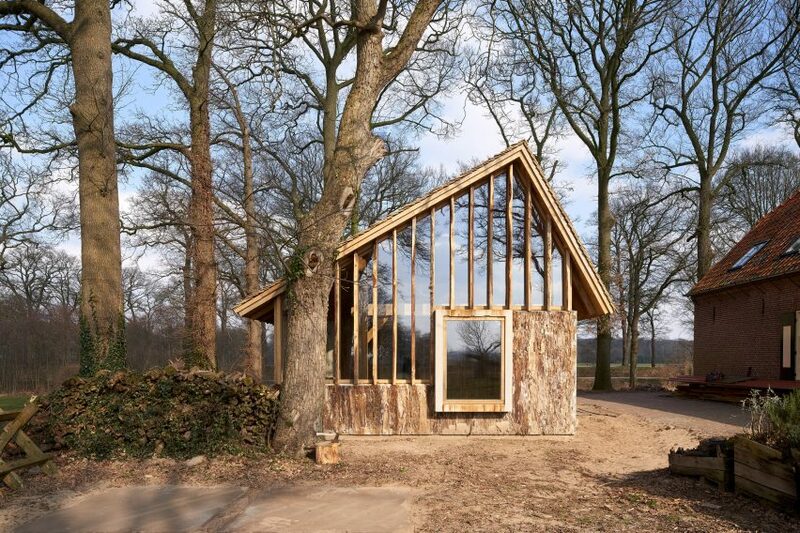 Annemariken Hilberink and Geert Bosch created the barn after discovering that several trees on the site of their studio in a converted farmhouse, in the Meierij region of The Netherlands, needed to be cut down. Rather than selling the timber to a paper-manufacturing plant, HilberinkBosch Architects decided to use the wood to construct their own barn in the vernacular tradition of the region. “By replacing a collage of obsolete shelters and sheds, we wanted to build a new barn with locally harvested materials employing traditional techniques, in line with our farm’s monumental character,” the architects explained. 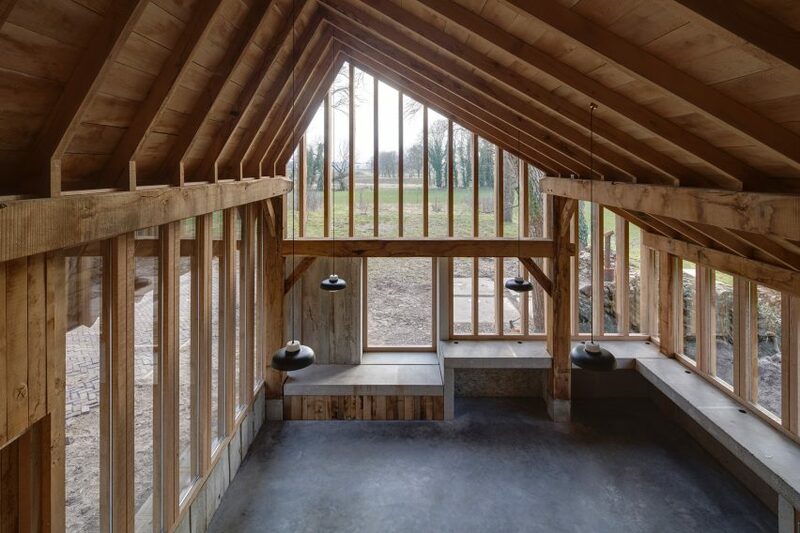 Internally, the barn accommodates a storage room and a space that can be used as a workshop or meeting room. A loft level above the central storage area overlooks the workshop below. 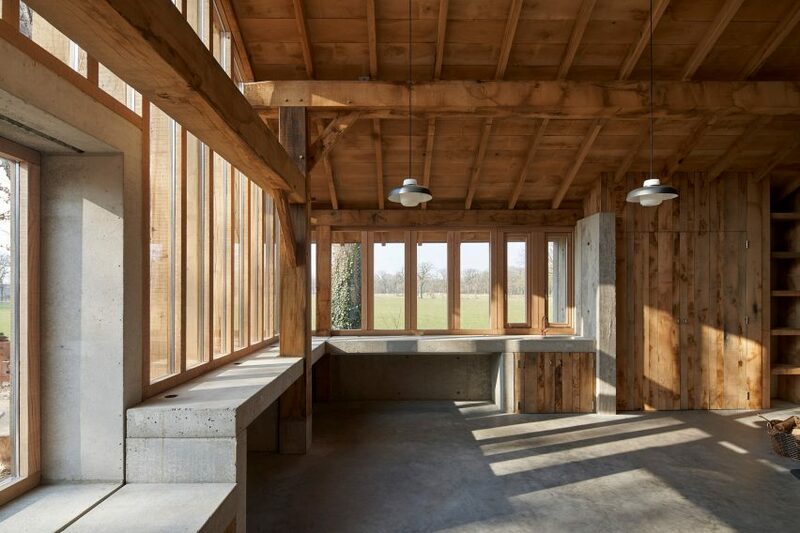 The felled trees, along with a couple of oak tree trunks sourced from a nearby estate, provided all of the timber required to construct the building. 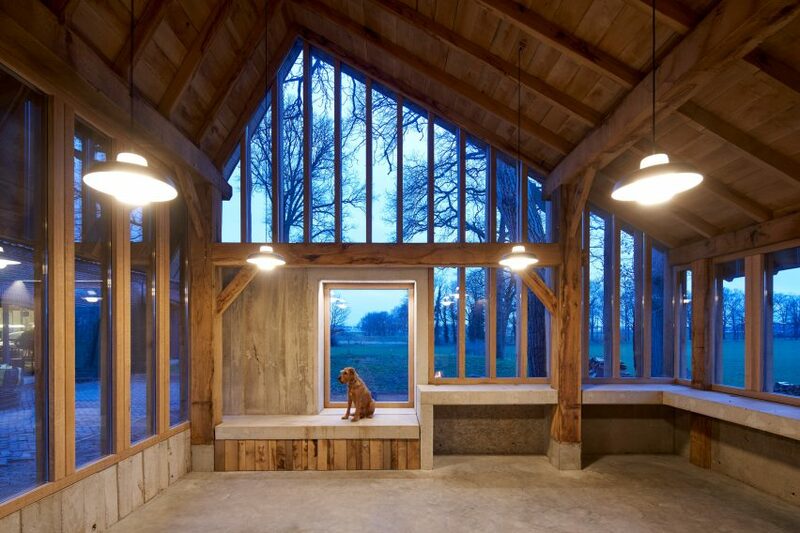 The studio sought to utilise the wood in a variety of ways to help the barn blend in with its natural setting. The main structure comprises four tie-bar trusses made from the trunks of the trees, which support stringers extending the length of the building. The stringers are topped with rafters that hold up the asymmetric pitched roof. The trees that were removed from the site were carefully felled and processed using a mobile saw mill that produced the structural timber used for the frames, as well as planks for cladding the facades. The strongest sections from the cores of the tree trunks were squared off and became part of the frame, with the remaining pieces used for different purposes. Some of the outer pieces with bark still attached form a slatted screen that shields the glazing filling the end wall of the workshop and the open carport. Concrete used for the external walls is mixed with bark to create textured surfaces that complement the surrounding trees. Other concrete sections were cast using formwork made from planks that left an imprint of the wood on these surfaces. Short pieces of wood were cut into shingles used to cover the roof, while the remaining timber was chopped into firewood for heating the building. Timber, concrete and glass are the only materials used throughout the building, with the natural textures and hues left exposed. Remnants of iron and steel from barbed wire or shrapnel that became embedded in the wood during the second world war adds to the character of the surfaces, while tannic acid from the untreated window frames has been allowed to stain the outer wall of the workshop. Large windows lining the workshop space provide views out across the neighbouring estate. The timber mullions separating the glazed panes create a vertical rhythm that is accentuated by the configuration of the rafters. 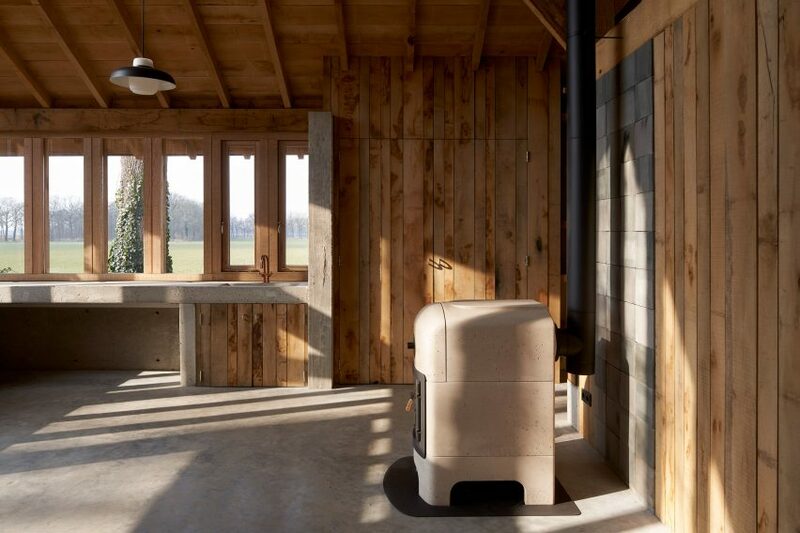 A concrete stove is positioned in front of a wall of vertical oak boards that conceals a staircase leading to the loft. Photography is by René de Wit.